Note: The photos that I have been sharing have been showing up with odd orientations for some folks. I have tried a few times to fix this and seem to be unable to do so. I will be leaving Costa Rica tomorrow days and will not have access to wifi again until I arrive in San Diego on December 21. I will do my best to fix the problem then. Thank you! 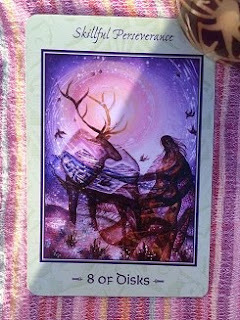 Today's card is, the eight of disks, is about balanced perseverance over the long haul. When we are working towards a goal some of us will become 100% focused on the goal at the expense of all other things in our lives while others procrastinate and put off when needs to be done until the last minute. The key is to find that balance between work, rest, physical and emotional nourishment, etc. I am not always great at doing this. My major goal over the past five years has been to finish school and earn my degree. This is something that will be brought to completion this spring. I am pretty sure I've never found a complete balance in my pursuit of this goal. In fact I've spent much of the past five years stressed out, full of worry and feeling overburdened. I have gone from one extreme to the other when it comes to procrastination verses careful planning. At times I have put school first in my life and when I do so other parts, such as my more creative life will suffer. Other periods I have put my creative life first and school has suffered. It has not been an easy balancing act. Somehow I'm about to receive a bachelor's degree in sustainable business with a minor in environmental sustainability with a fairly respectable GPA which was achieved while still having a life outside of school. I'm not quite sure how I've managed to get through it but I have. The past few months of Semester at Sea have been the first time in my adult life in which I've only had one major focus to my life, just school. At first this felt rather good. I felt like I had enough time to get everything done and was feeling minimal stress. However, it did not take at all long for me to begin to feel antsy and bored. It was not too long after this that I began to teach belly dance on the ship and help out with other events on board. I never felt overwhelmed or like I had too much to do.